Windows 8 iPad Rivals Ahoy! Disheartened with slow sales of Android tablets, reports say some manufacturers are putting their best efforts behind iPad rivals running Windows 8 Among the first may be Acer, Toshiba, and Asus, which are expected to unveil next week at the Computex show in Taipei a sleeve of Windows 8 tablets with foldable or detachable keyboards, according to a Bloomberg report. Microsoft’s Windows 8 has been in the making for the past few months and the company made available a release preview this week, meaning the OS is in the final phase of development. Windows 8 feature a traditional desktop as well as a touch-optimized Metro interface akin to the acclaimed Metro UI on Windows Phone 7. (See: "First Look: Windows 8 Release Preview"). With a near-final version of Windows 8 now available, it seems logical for manufacturers to begin parading the devices they are going to build for the new OS, with tablets to rival the iPad appearing first. Bloomberg's unnamed sources expect the first peek at Computex. Asus will apparently present Windows 8 tablets similar to its Android Transformer line, which has detachable keyboards; while Toshiba is set to unveil a tablet and a notebook-like device. It’s still unclear which of these Windows 8 tablets will run on Intel chips (like a first Samsung prototype which had a fan! ), or on ARM-based chips like the iPad, which Microsoft’s new OS supports. It’s believed Toshiba and Asus will go for a tablet based on Nvidia’s ARM-based Tegra chips initially, with an Intel powered machine coming from Acer. One other notable manufacturer joining the Windows 8 tablet fray will be Hewlett-Packard, the company said earlier in May. After it bought Palm, HP released a WebOS tablet that was popular only after it went on a clearance sale. Since then HP has not attempted to build another tablet or phone using WebOS, releasing the OS to the open-source community. Dell doesn’t want to miss the Windows 8 tablet party either, as purportedly leaked specifications indicate it has a 10.1-inch tablet running the new OS in the pipeline as well. 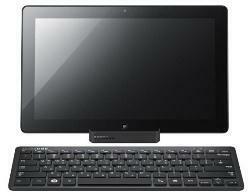 So don’t ditch your iPad or Android tablet yet in anticipation of a Windows 8 slate. While we might get a glimpse at the upcoming tablets next week, Microsoft has yet to announce a public release date for Windows 8, and pundits place the release in fall -- meaning we’re at least a few good months away from seeing such iPad competitors on the market.